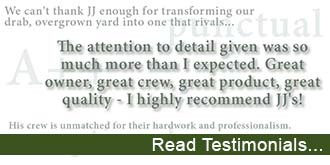 Testimonials – JJ's Landscaping Inc. It is obvious that testimonials, will in most cases, favor the contractor - I don't know anyone who wants to put bad testimonials in public view - but we believe there is value in hearing about other peoples positive experiences. I also want you to know if I were to get negative feedback I would make it a point to make the situation right - so in the end anyone who may have had an issue will be satisfied and will want to give a good testimonial! Below are testimonials from actual clients, some have provided names, some are from my listing on Angie's List, and can be viewed by clicking on this link to go to Angies List. After calling around the Pittsburgh and surrounding area and obtaining quotes to replace a retaining wall that is 20 foot by 11 foot high, and not to mention the wall would have to be constructed from my neighbors property, I was at the end of my rope and nerves with sleepless nights in fear this wall would fall into the neighbor's yard causing damage and maybe hurting someone. (This is something that insurance will not cover), I was referred to call J.J.s Landscaping. From the first phone call with J.J. I was convinced that I wanted him for the job. Before a price was even mentioned the first words that were said to me that none of the others said was, " I promise I will do a job that you will be happy with YOU HAVE MY WORD. J.J. s Landscaping came out the next day looked at the wall and gave me options for replacement. (None of the other contractors gave me an option in replacement or pricing) Needless to say I hired J.J.s Landscaping after we discussed the options and price. The construction was completed in less than 2 weeks. The workers showed up every day on time, cleaned up as they worked, were very polite,(no loud music playing, no swearing) The wall is completed. My neighbor is happy, they repaired and replaced all of my neighbor's lawn. The wall is beautiful and now adds more value to my property. I would recommend J.J.s Landscaping to everyone. Thanks for giving me peace of mind and not breaking my wallet? JJ's Landscaping was recommended to us through a co-worker. We initially hired JJ and his team to replace a cracked, leaning retaining wall.We were so happy with the quality of the work, fair price, and JJ's professionalism that we have since hired him repeatably for the last several years to do many more projects including landscaping our property, installing a French drain, and replacing our wood deck with composite. JJ's landscaping is our go to vendor when it comes to anything with our property. Sincerely, Jeneen and Derek A.
JJ's Landscaping did an extensive amount of work on our acre of property last summer. He installed french drains, cisterns and re-landscaped after the work. He and his crew worked tirelessly to get the job done in a timely and professional manner, including replanting some plants and bushes. JJ followed up a few weeks later to make sure things were settling as expected. We are pleased with the work, and in fact are having more work done shortly for more relandscaping. We highly recommend JJ's Landscaping! J.J's crew replaced a retaining wall in front of my house. I was told it would take 2-3 days and it actually took 3 days. At the end of each day they cleaned up the mess,which I really appreciated since I live on a very busy street.When I thought they done with the project it didn't look like it was quite finished. I contacted J.J.(owner) and he had his crew add another course of block the next day at no additional cost.I really like the way it turned out.I'm planning on hiring JJ in the future for some concrete work and recommend him to anyone. 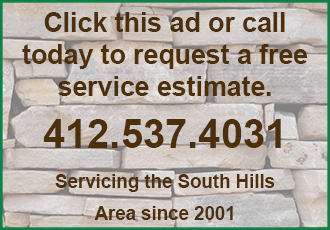 Absolutely, please feel free to call me at: 412-537-4031 or click this link to complete an online estimate request form. Good question, because that is an important question people may not ask. Yes, we are insured - not only to protect our workers in the case of an injury, but we carry additional home owner liability insurance to protect you, the home owner as well. We will provide certification upon request if you would like verification of our coverage. Personally, not always. But I do not hire outside contractors to do the work, if there is a crew working on your project, they are one of my crew. I know it can be frustrating to think you have hired a specific person to do a project, and a totally different person shows up to do the work. I have multiple crews I will send to various jobs, but I tried sitting behind a desk and did not like it - so you may very well see me out there working with your crew on a certain day, or checking in on their progress, but even if I am not at your particular project, you can be confident I will know what is being done, and when. So rest assured if I do not personally do the work on some projects, my crew knows I expect the same level of quality from them as if I were working right beside them, because on any given day - I do. Fully insured for your protection, and ours It is not enough to ask a contractor if they are insured, you should also confirm they carry liability insurance to protect you, the homeowner. JJs Landscaping is fully insured and will provide certification upon request.